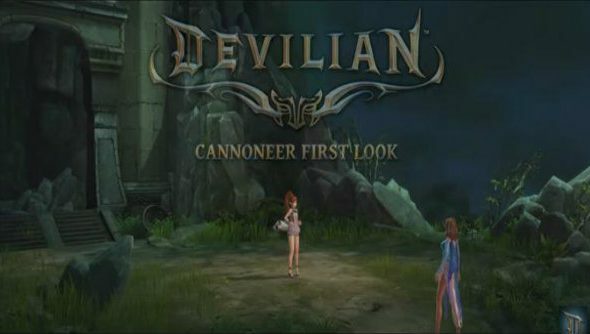 Trion’s Diablo-inspired ARPG Devilian just got a new video showing us our first look at its new class: the Cannoneer. The Cannoneer is a petite anime girl with a massive gun and high heels. She specialises in large area attacks, traps and, you know, shooting things with that big gun. Want to know more about Devlian? Read about howDevilian is a Diablo-like MMO that takes you straight to the fight. That big gun can even be upgraded to the point where she fires salvos of rockets, artillery strikes or even a massive area of effect warhead. In her devil form she unlocks a whole host of other abilities, including a buff that lets her run really fast, presumably before firing another few hundred rockets from a safe distance. The reveal video describes the Cannoneer as a “fast-paced, action-heavy class with a lot of emphasis on movement and mouse control”. You can try Devilian for free right now.